Dozens of wine bottles, hanging salami, and wheels of cheese embedded in tile have stood delicious sentry outside Billy’s Deli in Glendale for 45 years and now they are on the chopping block. When the restaurant closed in June, the building sold to a new owner who wants to remove an enormous artwork that decorates the façade. Artist Lee Whitten, whose family built the restaurant, created an architectural ceramic that included castings from real deli food. 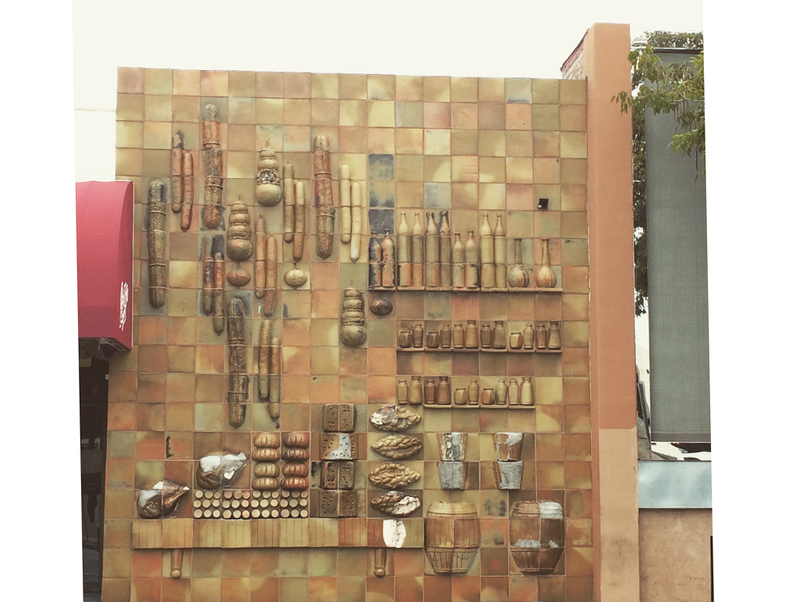 Whitten is now a retired Los Angeles City College art instructor, but in 1970 he was a young artist and asked the restaurant’s suppliers to showcase their finest fare for the three-dimensional sculpture. Fans of the artist (and the deli) have started a Go Fund Me campaign to remove and relocate the 323 tiles that make up the wall. Silver Lake Conservation would remove and preserve the bas-relief at a new location. Kick in some bread if you want to see the ceramic challah find a new home.